HAWAII has the highest millionaire-to-household radio in the United States, according to a division of New York-based Phoenix Marketing International. The winning number, 6.79 percent, might be so high because so many Hawaii households are house-less, but that's another story. 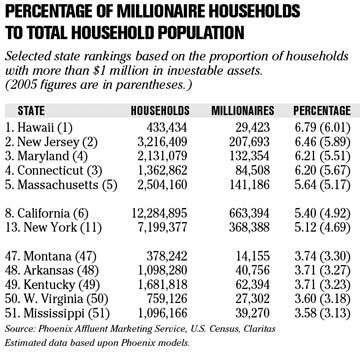 The Phoenix Affluent Marketing Service ranking of U.S. states and the District of Columbia counts the percentage of millionaires in each state. Hawaii tops the list this year, as it did last year -- and it was at or near the top in the years prior, said David Thompson, vice president and managing director of Phoenix Affluent Marketing. Some states' rankings , such as California at No. 8, down from No. 6 last year, and New York at 13 this year, down from No. 11 last year, are surprising. Poor Warren Buffett at Berkshire Hathaway was practically slumming in 2006 with his corporate HQ in Nebraska, which ranked No. 34. It's up to No. 29 this year with a 4.32 percent millionaire-to-household ratio. Households with greater than $1 million in investable assets are included in the millionaire category, but home values are not included, Thompson said. Phoenix Affluent included only "highly liquid assets," Thompson said. "We have a large-scale tracking study that we've been conducting for many years," he said. Using an algorithm to combine its own research, census data and information from Claritas Inc., a California-based marketing research firm, it comes up with the state rankings. The information "is really just one component of the service we provide," Thompson said. The company also studies "how affluent households behave," from a financial and lifestyle standpoint -- information that is helpful to financial services wanting to market themselves to that elite sector of the population. "We do some business with other players in the luxury space," but its clients are primarily in the financial services and wealth management industries.